At the top of the hill is the site of a log fort 30x30 feet in size, built in spring, 1864, for Capt. W.T. Wiant's Gilmer County Home Guards. Occupied until December, 1864. Burned days later by Confederates under Capt. Sida Campbell. Erected 1966 by West Virginia Historic Commission. Location. 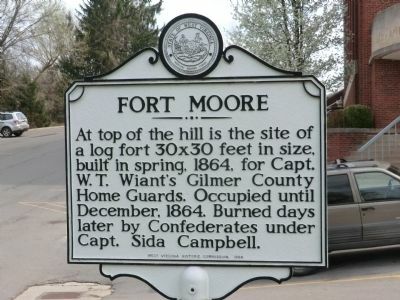 38° 56.19′ N, 80° 50.011′ W. Marker is in Glenville, West Virginia, in Gilmer County. Marker is on Pioneer Way (County Route 5/3) 0.2 miles east of North Court Street, on the right when traveling east. Touch for map. Located on the campus of Glenville State College. Marker is at or near this postal address: 200 High Street, Glenville WV 26351, United States of America. Touch for directions. away); Duck Run Cable Suspension Bridge (approx. 2½ miles away); Stagecoach Stop (approx. 7.1 miles away); Braxton County/Gilmore County (approx. 8.1 miles away). Touch for a list and map of all markers in Glenville. More. 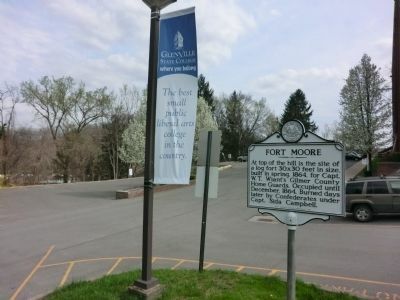 Search the internet for Fort Moore. Credits. This page was last revised on June 16, 2016. This page originally submitted on May 4, 2014, by Don Morfe of Baltimore, Maryland. This page has been viewed 491 times since then and 18 times this year. Photos: 1, 2. submitted on May 4, 2014, by Don Morfe of Baltimore, Maryland. • Bernard Fisher was the editor who published this page.